The Cleopatra slot from IGT is one of the most popular games of all time. The progressive slot game is based on the ancient Egyptian Queen. The last active Pharaoh of Ancient Egypt reigned from 51 B.C. until she died in 30 B.C. Queen Cleopatra was well known for her beauty and power of seduction, and so it is hardly surprising that Cleopatra’s theme is so immensely popular in the world of online casino games, thousands of years later. As a matter of fact, Aristocrat’s Queen Of The Nile was the inspiration for similar Egyptian-themed slots which there are many of now. First released in 2007, MegaJackpots Cleopatra is a newer version of the original Cleopatra online slots game, which offers you even more chances to collect impressive rewards. It is a 20-paylines slot game and comes with exciting features such as free spins bonus round, wild and scatter symbols, and wild multipliers. You’ll want to play the maximum number of lines to increase your chances of hitting a winning combination! The MegaJackpots Cleopatra reel symbols have the exotic Egyptian appearance to them and feature icons such as the Egyptian hieroglyphic eye, the scarab, lotus flower, gold pendant, a flail, and there are some regular symbols, nines through to aces. The scatter in the game is the flaming Sphinx symbol, but what differentiates MegaJackpots Cleopatra slots with the original game is the Mega Jackpot symbol, which acts as the wild and doubles all wins when it features on any pay line. In order to experience the 15 free spins bonus round to provide you with additional opportunities of hitting the “mega” jackpot, you need to hit three or more of the flaming Sphinx symbols anywhere on the reels at the same time. During the free spins bonus round, all wins are trebled (unless of course you trigger the Megajackpots prize) and you can re-trigger the free spins feature and potentially win as many as 180 free spins! Just remember that regardless of the coin value you’ve selected, you need to bet the maximum amount per spin to be eligible for the Mega Jackpot in the classic Cleopatra slot, which is a fairly typical requirement of hitting the progressive jackpot when playing online slots. If you are set on wagering the maximum amount, make sure you’re playing the Mega Jackpot Cleopatra slot and not the standard Cleopatra slot machine, which doesn’t have a progressive jackpot attached to it. The Mega Jackpot Cleopatra slot is designed to work in your web browser via Instant Play mode, so you won’t even need to download any software, and can start playing on your desktop right away. IGT do not provide the old-school downloads. While their slots work fine on tablets, they are not yet fully suitable for smaller phone-size screens. I advise you to test in play-money mode before you deposit if this will be your main way of accessing the games. There are two online slots games in the Cleopatra series released by IGT. The first instalment was an instant hit when it was first released in land based casino establishments as was the case when it was released in online casinos. It was only a matter of time before such a popular online slots game series became part of the MegaJackpots progressive jackpot network. 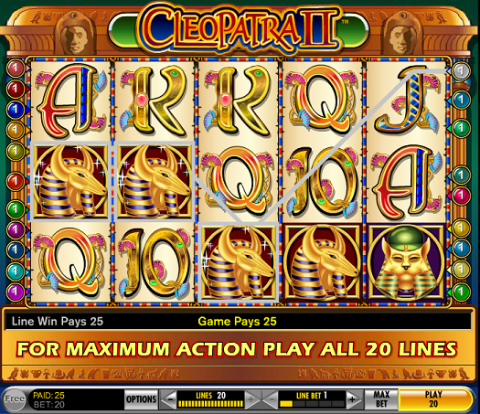 A year after the debut of the Cleopatra video slots game, it was added to the collection of Mega Jackpots slots games alongside the Monopoly and Cluedo progressives. The graphics in Cleopatra Mega Jackpot slot is bright and colorful and the authentic sound effects when you hit a winning line add to the games entertainment value. It will feel very familiar to you if you’ve played other Cleopatra slots. So what are you waiting for? Play Cleopatra Mega Jackpot slot at Mr. Green Casino. If you like playing Mega Jackpot Cleopatra, Pharaoh's Fortune video slot from IGT is worth your time checking out. See www.mrgreen.com now!